Start-ups looking to raise capital should be prepared to hear that their baby is ugly, attendees at an event in Dublin were told on Wednesday. Speaking at Enterprise Ireland’s annual start-up showcase, John Beckett, co-founder and chief executive of technology firm Channelsight, which has raised €3.3 million to date, also said that those looking for funding should expect to hear the word ‘no’ plenty of times. Mr. Beckett recalled how four companies turned down his start-up, which enables users to generate new revenue streams from digital content, within the space of an hour. “I was sleeping on my brother’s couch at the time in New York having just returned from seeing one of those companies in Boston so that was a real low point as I’d done four separate journeys abroad to pitch those firms,” he said. Mr. Beckett said good, honest feedback was critical for companies trying to refine their pitch and said while there is a brief period of relief when you do seal a deal, it only lasts for a short period. “The honeymoon is very short because you quickly remember about the sizeable targets you promised you’d meet,” he said. The entrepreneur was one of a number of speakers at the Croke Park event, which was attended by more than 600 companies and investors. Patricia Scanlon, founder and chief executive of speech-recognition start-up SoapBox Labs, which is developing a ‘Siri for kids,’ warned that fundraising takes much more time than you expect and can be all-consuming. “You need to have the initial conversations a long time before you need the money. There is no point having conversation three months before you’re about to run out of cash. You need to be having them nine months or even a year before that,” she said. Founded in 2013, SoapBox, last month announced it had raised a further €2.1 million, to bring total funds raised to date to €3.1 million. 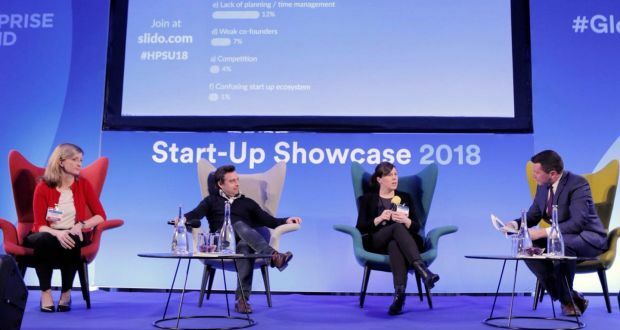 Helen McBreen, a partner with VC firm Atlantic Bridge, which has backed a number of Irish companies, including Movidius, FieldAware, PolarLake and Swrve, said start-ups only have a limited time to impress funds and need to have a good story to tell. “Start-ups need to have a laser focus on customers and yet too many times we hear pitches and the word doesn’t come until way into the conversation,” she said. Ms. McBreen added that while it can be difficult to get investment in Ireland, it is more often a case that start-ups are pitching to the wrong investors. Susan Spence, co-founder of software firm Softco, which late last year announced it had won a $20 million contract with the Finnish government, said the most challenging phase for a company is when they are in a growth phase. “Growing and scaling your business is a bit like the mantra used in rugby about ‘earning the right to go wide’. You cannot scale your business unless you have sorted out the structure of your company, the defense part of the business, cash flow and so on to go forward,” said Ms. Spence. Enterprise Ireland, which invested €31 million in 181 Irish start-ups last year, announced a new €500,000 fund for regionally based start-ups at Wednesday’s event. The fund will provide up to €50,000 in equity funding for up to 10 successful applicants.